The liberal arts are techniques for freedom. 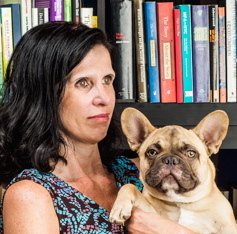 Mikita Brottman is a Professor in the Department of Humanistic Studies at the Maryland Institute College of Art, and a psychoanalyst. In her writing and teaching, she explores her interests in literature, psychoanalytic thinking, forensics, animals, and true crime. She has taught various courses at JCI since fall 2012. Her book about teaching advanced literature to the prisoners at JCI, The Maximum Security Book Club, will be published in May 2016 by HarperCollins. She lives in the beautiful old Belvedere Hotel in Baltimore, with her partner, the movie critic David Sterritt, and their small French bulldog, Oliver.